When the goal is flexible, portable dispatching, Avtec offers Mobile Scout™ seat licenses to provide options that address a diverse range of dispatch environments. With a sleek, mobile design, this dispatch console solution offers a streamlined alternative to carrying multiple radios on-site or in a command vehicle. 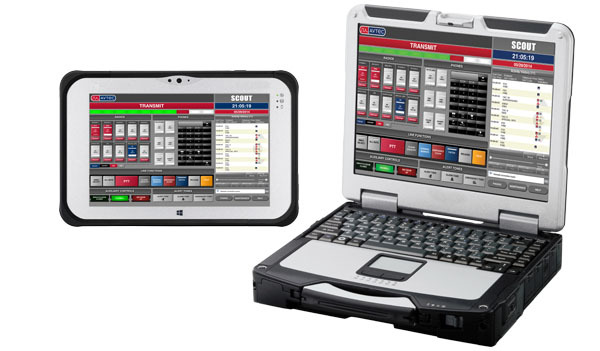 Mobile Scout consoles run on a Windows® tablet or laptop, are Bluetooth® compatible, support USB connections, and work over a corporate Wi-Fi network or via LTE through a Virtual Private Network (VPN) connection. A portable, full-featured IP console for dispatchers and other users who need access to the full feature set and endpoint range of a Scout console. Mobile Scout runs on a Windows® tablet or laptop, are Bluetooth® compatible, support USB connections, and work over a corporate Wi-Fi network or via LTE through a Virtual Private Network (VPN) connection.